مدیریت کیفیت آب در آبخوان‌های چندمنظوره نیازمند بررسی وضعیت کیفی آنها براساس استانداردهای چندگانه است. با توجه به کمبود مطالعات در زمینه پایش آبخوان‌های چندمنظوره، این پژوهش با هدف بررسی وضعیت کیفی آب‌ زیرزمینی آبخوان چندمنظوره کشاورزی- معدنی- شرب- صنعتی شهر بابک بر اساس شاخص‌های چندگانه (تناسب کشاورزی، آبیاری تحت فشار، شرب و کاربری صنعتی) صورت گرفت. مدل بهینه تغییرات مکانی پارامترهای کیفی آب در واریوگرام کروی، نمائی و گوسی با روش‌های کریجینگ و IDW(1-3) بر اساس شاخص‌های RMSE, MAE, RSS, R2 برای 16 پارامتر مورد بررسی، انتخاب شد. پهنه‌بندی چندمنظوره در محیطGIS و بر اساس استانداردهای تناسب آب ویلکاکس، شولر، آبیاری قطره‌ای و بارانی وزارت نیرو، چهار شاخص خورندگی و رسوب‌گذاری و استانداردهای WHO و IRISI با لایه‌های اطلاعاتی 16 گانه‌ صورت گرفت و تحلیل همبستگی مکانی متغیرها نیز انجام شد.نقشه‌های پهنه کیفی نشان داد در 100 درصد مساحت دشت، شاخص‌های پوکوریوس، لانژیلر، خورندگی و رایزنر چند برابر آستانه و بیانگر پهنه خورندگی وسیع در کاربری صنعتی بود. 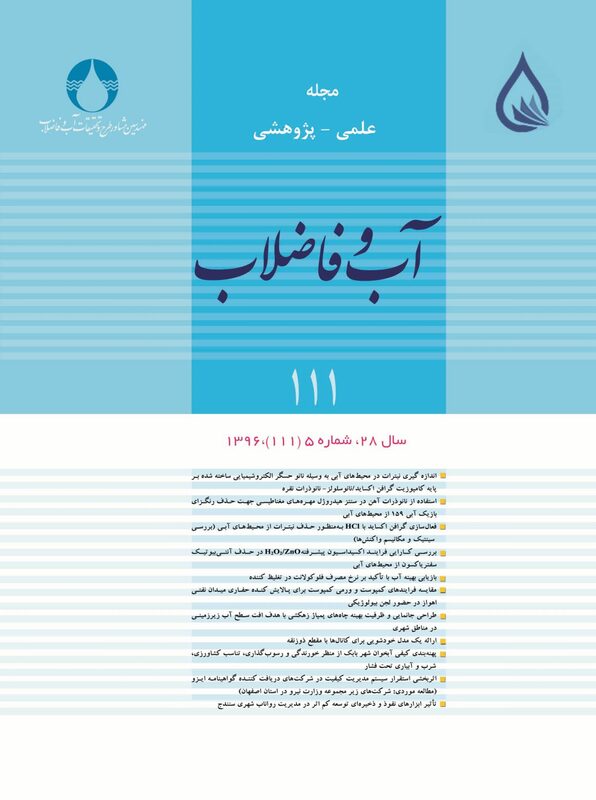 طبق نتایج، 93 درصد مساحت دشت در کلاس‌های C4-S1 و C4-S2 نامناسب برای کشاورزی قرار گرفت. فقط3/1 درصد از مساحت دشت قابل قبول برای شرب بود. نقشه پهنه‌بندی آبیاری قطره‌ای نشان داد که 6/47 درصد از مساحت دشت بیشترین محدودیت را از نظر کیفیت آب دارد. با توجه به درصد وسیع پهنه‌های نامناسب آب‌های زیرزمینی آبخوان از منظر مصارف چندمنظوره کشاورزی، شرب، صنعت و معدن لازم است استراتژی‌های پایش و مدیریت کیفی متناسب با نوع مصارف و اهداف توسعه اعمال شود. Water quality management in groundwater aquifers requires accurate water quality monitoring to ensure they meet a variety of relevant standards. Given the rather few reported studies in the field, the present study was designed and implemented to investigate the groundwater quality of Shahr-e-Babak aquifer that is exploited for agricultural, mining, drinking, and industrial consumptions. The kriging and IDW (power:1-3) techniques with spherical, exponential, and Gaussian variogramsare were compared using R2, RMSE, MAE, and RSS indices to find the optimum model for determining the spatial variability of sixteen groundwater quality parameters. Multi-purpose zoning of groundwater quality was accomplished in the ArcGIS environment in terms of the Wilcox, Schuler, drip and sprinkle irrigation as delineated by Iran Power Ministry, corrosiveness, and sedimentation standards as well as the WHO and IRISI indices before spatial correlations were determined accordingly. Based on the water quality zoning maps thus derived, Langelier, Corrosiveness, and Ryznar indices were several times larger than the threshold levels across the whole aquifer plain, indicating the wide corrosiveness of the water in industrial applications. The results also revelaed that 93% of the groundwater in the plain area was classified as C4-S1 and C4-S2, which are unsuitable for irrigation, while only 1.3% of the groundwater was acceptable for drinking uses. Drip irrigation zoning revealed that 64% of the plain area had the lowest water quality.The undesirable quality zones in a vast area of the aquifer investigated calls for accurate quality monitoring and management to meet the development objectives in the region. Annapoorna, H. & Janardhana, M.R., 2015, "Assessment of groundwater quality for drinking purpose in rural areas surrounding a defunct copper mine", Aquatic Procedia, 4, 685-692. Abrishamchi, A., Taheri-Shahraiyni, H. & Tajrishy, M., 2012, "Groundwater vulnerability assessment to pesticides and their ranking and clustering", Journal of Water and Wastewater, Vol. 23 No. 3 (83), 27-16. (In Persian). Al-hadithi, M., 2012, "Application of water quality index to assess suitablity of groundwater quality in Ratmao- Pathri Rao watershed, Haridwar District India", Scientific and Industrial Research, 3(6), 395-402. Alizadeh, A., 1999, Drip irrigation (principle and applications), 2nd Ed., Imamreza Publisher, Mashhad, Iran. AWWA, 1984, "Determining internal corrosion potential in water supply systems", American Water Works Association, 76(8), 83-88. Amiri, V., Nakhaei, V. & Sohrabi, N., 2014, "Groundwater quality assessment using water quality index weighted entropy", Advance Application Geology, 7, 31-40. (In Persian). Asghari-moghadam, A., Javanmard, Z., Vadiati, V. & Najib, M., 2015, "Groundwater quality assessment of Mehrban aquifer using GQI FGQI indiecis", 1(2), 79-98. (In Persian). Azizi, F., & Mohammadzadeh, H., 2012, "Vulnerability zoning and quality assessment of Imamzadeh aquifer usin DRASTIC and GWQI methods", Water Engineering, 5(13), 11-14. (In Persian). Ehsani, S., Salehpour, M., Ardekni, H., Abasi, H. & Poyan, M., 2014, "Investigation of scale and coorsion potential of groundwater quality of Sary city", Human and Envirionment, 24, 19-31. (In Persian). Ghaemizadeh F. & akhevan, S., 2014, "Applicabilty of under pressure irrigation systems based on water quality in Hamadan aquifer", Soil and Water Conservation Journal, 1(21), 65-85. (In Persian). Goovaerts, P., 1997, Geostatistics for natural resources evaluation, Oxford University Press, New York. Hamza, S.M., Ahsan, A., Imteaz, M.A., Rahman, A., Mohammad, T.A. & Ghazali, A.H., 2015, "Accomplishment and subjectivity of GIS-based DRASTIC groundwater vulnerability assessment method: A review", Environmental Earth Sciences, 73(7), 3063-3076. Hofmann, J., Watson, V. & Scharaw, B., 2015, "Groundwater quality under stress: Contaminants in the Kharaa River basin (Mongolia)", Environmental Earth Sciences, 73(2), 629-648. Iqbal, J., Gorai, A.K., Katpatal, Y.B. & Pathak, G., 2015, "Development of GIS-based fuzzy pattern recognition model (modified DRASTIC model) for groundwater vulnerability to pollution assessment", Environmental Science and Technology, 12(10), 3161-3174. Jang, C.S. & Chen, S.K., 2015, "Integrating indicator-based geostatistical estimation and aquifer vulnerability of nitrate-N for establishing groundwater protection zones", Hydrology, 523, 441-451. Jing, X.Y., Yang, H., Cao, Y. & Wang, W., 2014, "Identification of indicators of groundwater quality formation process using a zoning model", Hydrology, 514, 30-40. Junior, R. V., Varandas, S. G. P., Fernandes, L. S. & Pacheco, F. A. L., 2015, "Multi criteria analysis for the monitoring of aquifer vulnerability: A scientific tool in environmental policy", Environmental Science and Policy, 48, 250-264. Kinsela, A.S., Jones, A.M., Collins, R.N. & Waite, T.D., 2012, "The impacts of low-cost treatment options upon scaleformation potential in remote communities reliant on hard groundwaters. A case study: NorthernTerritory, Australia", Science of the Total Environment, 416, 22-31. Kumar, P., Bansod, B.K., Debnath, S.K., Thakur, P.K. & Ghanshyam, C., 2015, "Index-based groundwater vulnerability mapping models using hydrogeological settings: A critical evaluation", Environmental Impact Assessment Review, 51, 38-49. Malekotian, M., Mobeini, M., Sharif, I. & Haghighipour, A., 2014, "Corresive and sedimentational potential of urban water networks in rural wells of rafsanjan", Rafsanjan University of Medical Sciences, 13(3), 304-293. (In Persian). Nashat, A. & Nikpour, N., 2010, "Using GIS for under pressure irrigation location selection in Kerman aquifer", Water Resources, 4, 77-84. (In Persian). Nasseri, M., Tajrishy, M., Nikoo, M. & Zaherpour, J., 2011, "Recognition and spatial mapping of multivariate groundwater quality index using combined fuzzy method", Journal of Water and Wastewater, Vol. 24 No. 1 (85), 82-93. (In Persian). National Reasearch Council., 1993, Groundwater vulnerability assessment: Contamination potential under condition of uncertainties, National Academy Press., Washington, D.C., 185pp. Oikonomidis, D., Dimogianni, S., Kazakis, N. & Voudouris, K., 2015, "A GIS/Remote sensing-based methodology for groundwater potentiality assessment in Tirnavos area, Greece", Hydrology, 525, 197-208. Pourakbar, M., Mosaferi, M.S., Khatibi, A. & Moradi, M., 2015, "Groundwater quality assessment from a hydrogeochemical viewpoint (A case study of Sarab county)", Journal of Water and Wastewater, Vol. 26, No.3 (97), 116-126. (In Persian). Rezaei, F., Safavi, H.R. & Ahmadi, A., 2013, "Groundwater vulnerability assessment using fuzzy logic: A case study in the Zayandehrood aquifers, Iran", Environmental Management, 51(1), 267-277. Setayesh, F., Mazrouei, F., Ebrahimi, A. & Dastjerdi, M., 2014, "Zoning of Isfahan drinking water distribution network corrosion potential in summer and autumn of 2011 using Geographic Information System (GIS)", Journal of Water and Wastewater, Vol. 25 No. 1 (89), 91-96. Taghipour, H., Shaker-khatibi, M., Pourakbar, M. & Jafarpour, S., 2012, "Corrisive and sedimentation potential in urban water network of Tabriz City", 15th National Congress of Environmental Health, Tehran, Iran. Varol, S. & Davraz, A., 2015, "Evaluation of the groundwater quality with WQI (Water Quality Index) and multivariate analysis: A case study of the Tefenni plain (Burdur/Turkey)", Environmental Earth Sciences, 73(4), 1725- 1744. Wang, X.J., 2006, "Study on evolution and formation of chemical composition of groundwater in Yinchuan Plain", Chan’an University Paper, 4, P641.12. Zhang, Q. & Zhang, L., 2010, "Main water environmental problem and its countermeasures in Yinchuan Plain", Earth Science Environmental, 32 (4), 392-397. Zheng, G., & Wang, R., 2006, "Research on the bearing capacity of water resources in Yinchuan Plain", Ningxia University, (Nat. Sci. Ed. ), 27 (1), 80-83.